We are now at the mastering and manufacturing stage and could use a little financial help to complete the project and release our music to the world. Our deadline for completion of manufacturing, aka the creation of actual physical cds, is early March; this fundraising campaign's deadline is March 22, 2019. Your financial contributions are an integral part of the process by which Jabbour's new music can make it into your hands as well those who will be interested in booking us at great venues all around the world - yes, the world. We can't think of a better way to be part of the solution, rather than the problem, than to create music and spread it as far and wide as possible. More music, less war. Jabbour's second album is called Saint Bernard. Haven, refuge, sanctuary… Saint Bernard exists within the songs on this album. 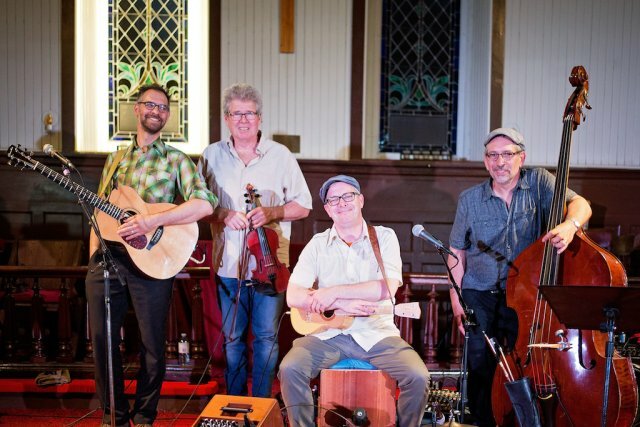 One Québécois auteur compositeur, one PEI singer songwriter, one fiddler rooted in Irish tradition and one jazz and blues bassist invite you to explore the musical universe of Saint Bernard. Mastering comes at a cost of about $1,000 and manufacturing (physical production of the cd) 250 copies of the album costs about $1,000. Our mastering engineer is Harris Newman at Greymarket mastering, the best in the business! From there, we will be handing the task over to Montreal CD duplication company RSB iMedia, who also worked on our first album 'Round the Clock. The whole process takes about 3 weeks and we are right on schedule! Should we raise more funds than necessary, we will be in a good position to invest in some new T-shirts, perhaps featuring the cartoonified versions of us from a while back... remember those? A love of musical collaboration, Cajun music and travel brought them together. These talented high-energy musicians bridge gaps and draw parallels between the musical genres that inspire their own songwriting. From Guillaume Jabbour’s roots in chansonnier music from Québéc and France, to Bill Collier’s work as a musician collaborating with many of the east coast’s finest singer songwriters, to Bill Gossage’s musical culture that draws upon deep roots in the Irish fiddle vernacular, and finally to Carl Rufh's bass work with some of Canada's well known jazz, blues and folk acts, Jabbour is a contemporary roots band. Having played in various musical projects (Grouyan Gombo, Les Flâneurs, Dave Gossage, La montagne secrète, The Durham County Poets), the members of this band combined their creative abilities forming a project focused on original works. Collaboration has been a key element in the creation of both albums. It isn't always easy working together, but the members of Jabbour have the hard conversations and make difficult judgement calls. They do this for each and every song and this happens at every stage of the creation process with the songwriter always retaining the "FINAL SAY". This makes for an album that is rich with combined efforts and, above all, soul. A physical copy of Saint Bernard to be picked up at our album launch in Montreal (venue to be confirmed). This includes your entrance fee to attend the album launch with a guest if you would like to pick up your cd in person. A physical copy of Saint Bernard mailed to your door. Physical copies of both Saint Bernard and 'Round the Clock to be picked up at our album launch in Montreal (venue to be confirmed). This includes the entrance fee for two people to attend the album launch. Physical copies of both Saint Bernard and our first release 'Round the Clock mailed to your door. Guillaume Jabbour will come to your house or a place of your choosing and play a 45-minute solo acoustic concert. Island of Montreal and surrounding areas. 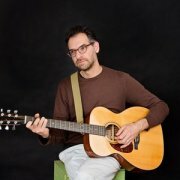 A house concert by Jabbour in Montreal or surrounding areas.